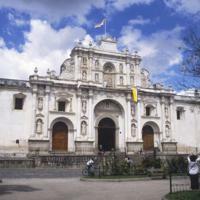 The community of Antigua, the capital of the Audiencia of Guatemala, began work on its cathedral in 1669. The vaults, closed in 1680, were mostly destroyed by the great earthquake of 1773. Today, though neither as large nor as grand as the cathedrals of Spanish America’s viceregal capitals, Lima and Mexico City, this church bears witness to the divergent lives of religious buildings in the Americas. Behind this peaceful façade lie the great ruined vaults of the original cathedral. 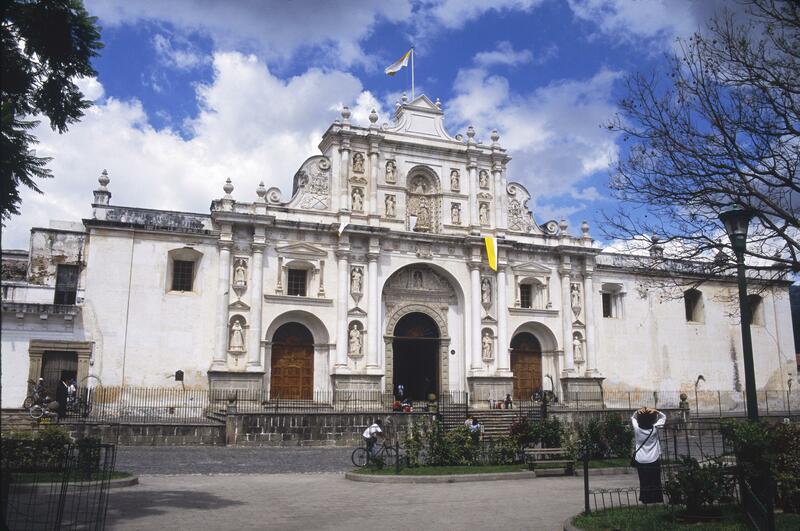 The cathedral was dedicated to Santiago, who also gave his name to the city, formerly Santiago de los Caballeros de Guatemala, today Antigua. After the earthquake of 1773, only the front part of the church was reconstructed. While this doorway was originally set on axis with the original nave, the smaller reconstructed nave now runs perpendicular to it. This is the second building to stand on the site, replacing an earlier 16th-century construction. Like many important commissions, this cathedral was designed by a Spanish-born architect, in this case, Martín de Andújar. When the cathedral’s initial vaults collapsed, Andújar was replaced by the Guatemalan mestizo José de Porras, who completed the building. Made of stone, brick and mortar, the building of the cathedral was an enormous enterprise, with workers—a hierarchy of Spaniards, mestizos and indigenous laborers—swarming the site for years. The cathedral follows European models, but its architect José de Porras designed a building that was markedly lower and broader than other buildings of its size in an unsuccessful attempt to make it earthquake proof. This building sits on Antigua’s main plaza. In this urban placement, it mirrors the cathedrals established in other important Spanish American cities. In the late 18th century, when Antigua was destroyed by earthquake, most of the citizens relocated 40 miles away to the newly founded Guatemala City where they established a new cathedral—that is, a new seat for a bishop. Today, this church in Antigua remains the city’s central house of worship, although it is no longer a bishop’s seat. Cathedrals were not only houses of worship, but also imposing symbols of religious and political authority. Antigua’s cathedral had its vaults collapse twice, first because of an architect’s mistake, then because of an earthquake. Creating enormous spaces for worship was a costly and perilous enterprise. But for residents of Spanish America, these spaces were both places where one could encounter the divine—an otherworld here on earth—as well as important manifestations of communal solidarity.